Upon first glance, the Tempo Carmel looks like a fairly typical hybrid bike with a very large battery pack on the downtube. That removable pack, which powers an MPF motor as well as a pretty bright front headlight, packs enough charge to power the bike for about 25 miles at full assist. And assist, is the key as the Carmel is a pedal assist e-bike only, meaning the motor only provides power when you are also pedaling. 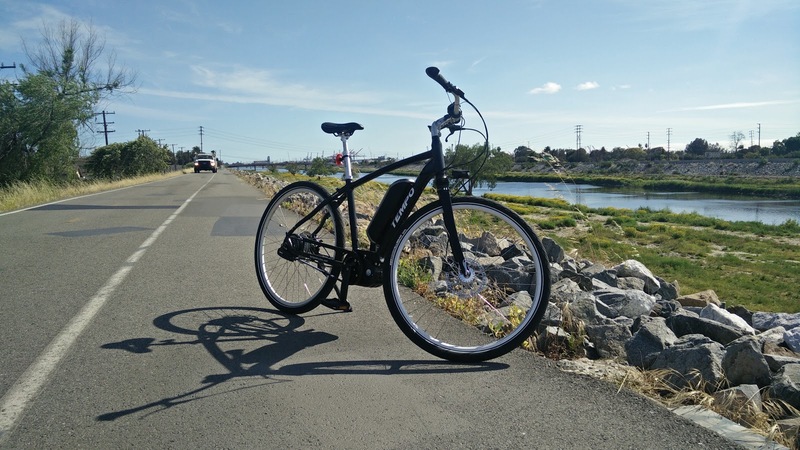 Equipped with a rear three-speed electric hub and 10 different levels of assist, the Carmel looks surprisingly normal and if not for the battery, would actually be a pretty comfortable regular bike. The seat is nice and is nice and wide while the bars are far back enough to allow a very relaxed seating position. The hydraulic disc brakes modulated nicely and stopped strongly. On its own, the Carmel could be a pretty nice bike to own. But hit the button to turn on the electric assist and the whole character of the bike suddenly changes. On low levels of assist, this can still be a very relaxed cruiser, but crank up the boost and all of a sudden, I am sitting upright and, barely breaking a sweat, pedaling my way past a peloton of cyclists, hunched over their drop bars, leaving them in the dust, at least until I hit the 20 mph cut-off. 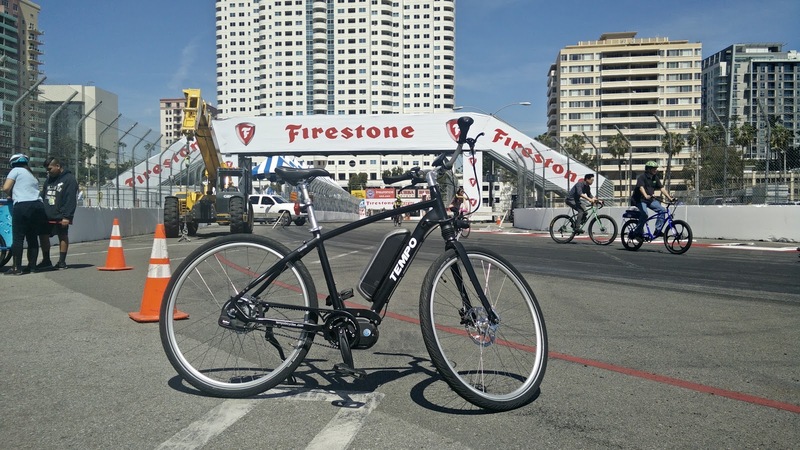 You see, regulations for pedal assist e-bikes dictate that for them to be road legal, they must stop providing assist after the bike reaches 20 mph. Not to say that you cannot go faster than 20 mph, just that beyond that speed, the motor is not providing any assistance. And to be clear, this is not a light bike. With the battery pack installed, the bike weighs a not exactly light 53-lbs. Maintaining a speed once you have reached it is not difficult, but getting the hulking mass of bike up to speed without the electric assist is a challenge in an of itself. During my time with the bike, I used it as my daily rider, running errands with it, going out with my wife to eat dinner, even using it to transport myself to a few meetings around town. 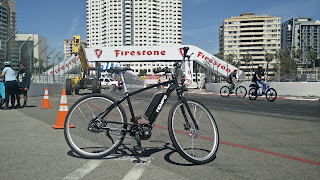 I also had the opportunity to ride it on the track for the Long Beach Grand Prix. As I adapted to the idea of having the electric assist available, I started to adjust my riding to take advantage of the assist when I could. Running around town, I kept the assist just enough to offset the massive heft of the bike itself. That meant keeping my riding pretty gentle and just cruising, but it made the ride easy and comfortable. 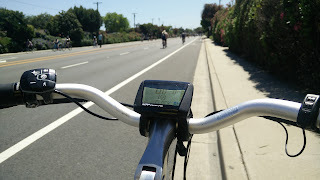 On days when I needed to be somewhere quick, I dialed up the assist and the bike allowed me to maintain a consistent 19.5 mph on the street while maintaining some semblance of composure when I arrived at my destination. And it is really that kind of use that helped me to understand how an e-bike might be truly helpful in an urban setting. I can absolutely imagine myself commuting to work using an e-bike (if I had a commute) because it would allow me to do a much longer ride without getting anywhere near as gross and sweaty as I would with a regular bike. Once I got home, charging the e-bike was a breeze. The bike's battery is little more than an over-sized laptop battery. The charger even looked like a laptop charger. Pop open the protective rubber cap and plug the bike in overnight and, by the next morning, the bike is fully charged. It barely registered on my electric bill at all. That is part of the beauty of this current generation of e-bikes - they are so easy to live with, you won't even need to think twice about living with them. Just plug in at night, unplug in the morning, and ride. Now, that is not to say the bike is entirely without quirks. The first oddity is that the ramp-up when pedaling takes a bit of getting used to. Normally, on a regular bike, the first pedal strokes require the most effort because you are accelerating from a stand still. 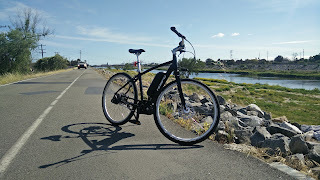 With the e-bike, the ramp-up is much quicker and creates a bit of an unnatural moment where I felt like I needed to reduce my pedaling effort or I was going to over spin the bike. It was an odd sensation and took a while to get used to. Once I got accustomed to it, it was easy enough to ignore, though when I shared that with the team at Tempo, they indicated they could update the calibration of the software to adjust how the assist came in. The other quirk is that a super heavy bike with a longish wheelbase takes a bit of effort to get to change direction. This bike was one where momentum could be both your friend and your enemy -- fantastic in a straight line, but awful if you wanted to turn. Getting the bike around a corner required a bit of advance planning to make sure to brake sufficiently and to allow a rather generous turning radius. 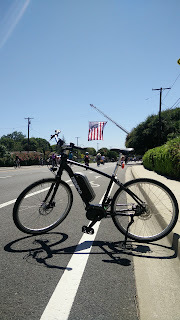 Quirks aside, my extended time with the Carmel had me convinced that e-bikes definitely have a place among our modern bike culture. 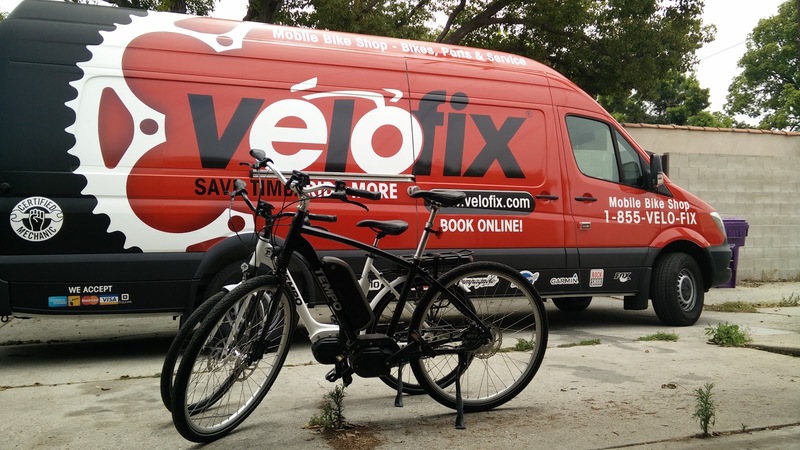 As more people seek out alternative ways to get around, it becomes more important that options like e-bikes be available as a choice for people who are transitioning out of their cars. Maybe they have not ridden a bike in a long time and feel like the electric motor makes them more comfortable when maneuvering in traffic. Maybe they are older and simply need the extra assist to compensate for an injury or an aging joint. Maybe they simply want to have the option of riding a bike to work without arriving so gross and sweaty that a shower is required before they can face their colleagues. Whatever the reasons, e-bikes are a great way to get people to consider cycling as a means of transportation and not purely as a form of recreation. 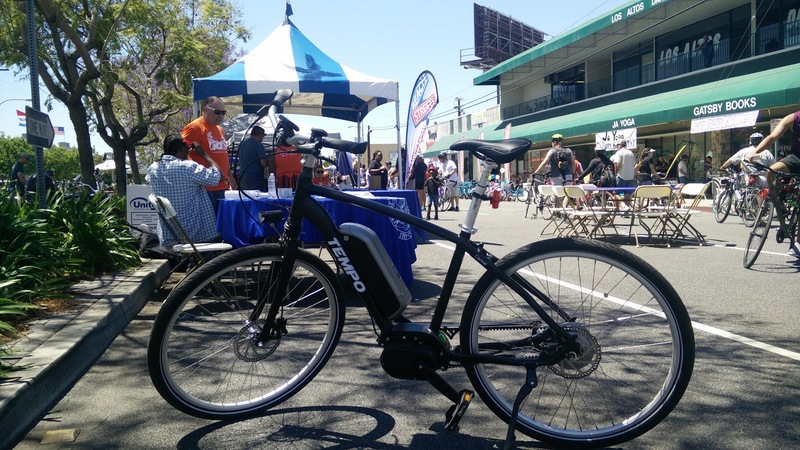 Companies like Tempo and other e-bike manufacturers should be encouraged to drive this market because I suspect there are lots of people who would make the change if they only knew how easy it really is. Although there is one major hurdle that still needs to be overcome, which is cost. 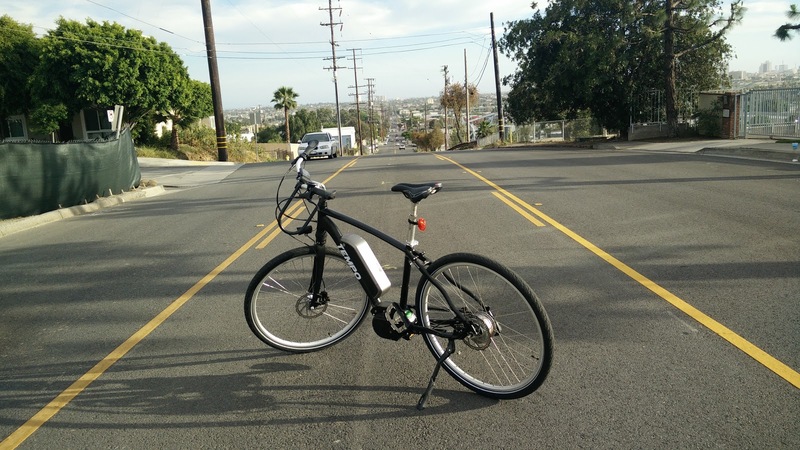 The current generation of these better equipped e-bikes are not cheap, coming in at around a $4,000 retail price. If we can find a way to bring that down to a more reasonable range, or find a way to subsidize the cost a bit much as we have done for electric cars, we might be able to encourage greater adoption. Special thanks to the team at Tempo Bicycles for lending me the Carmel and the Santa Barbara for the extended period. You can visit them at http://tempobicycles.com/ to see their full line-up of e-bikes and check out when they might be at a nearby event for you to try out one of their products.